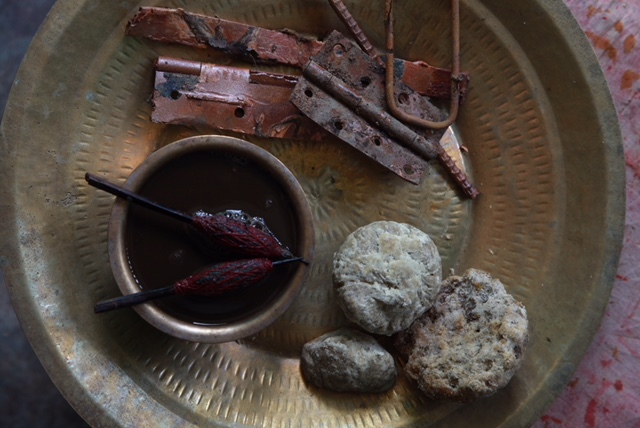 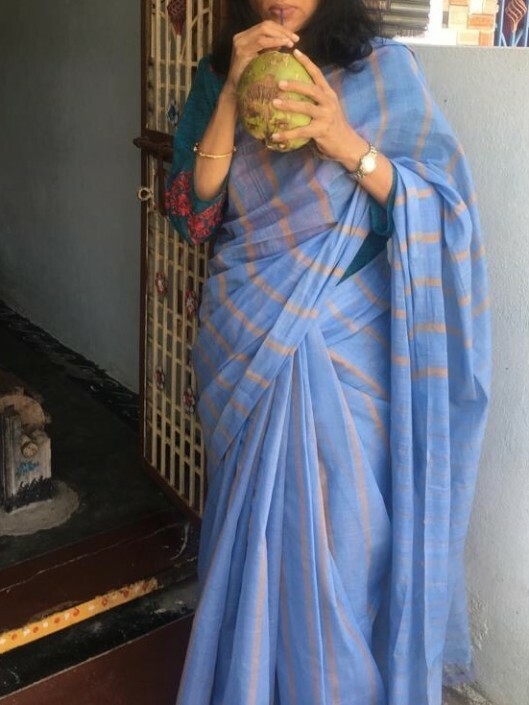 ‘Ugadi‘ is the festival of beautiful beginnings : the beginning of New Year according to the Hindu lunar calendar, for the people of Andhra, Telangana, and Karnataka, the beginning of Shatavahana or Shaka era, and the beginning too of the rich promise of spring with its riotous colors, abundant creativity and the spirit of joyous celebration. Telugu and Kannada speaking people in India and across the globe celebrate Ugadi by decorating their homes with floral ‘rangolis’, visits to temples, family get-togethers and cooking up the mouth watering Andhra culture like ‘pachadi’, cashew and gur cakes, syrup drenched sweets, laddus and more. 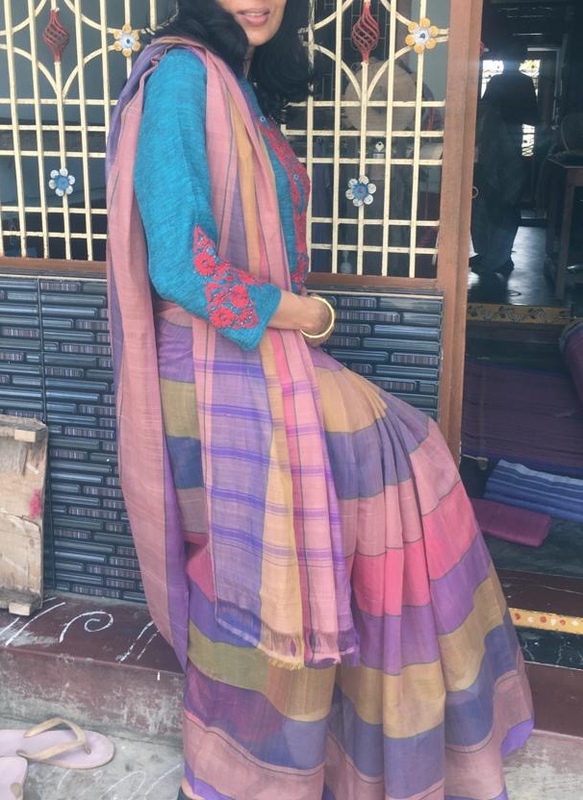 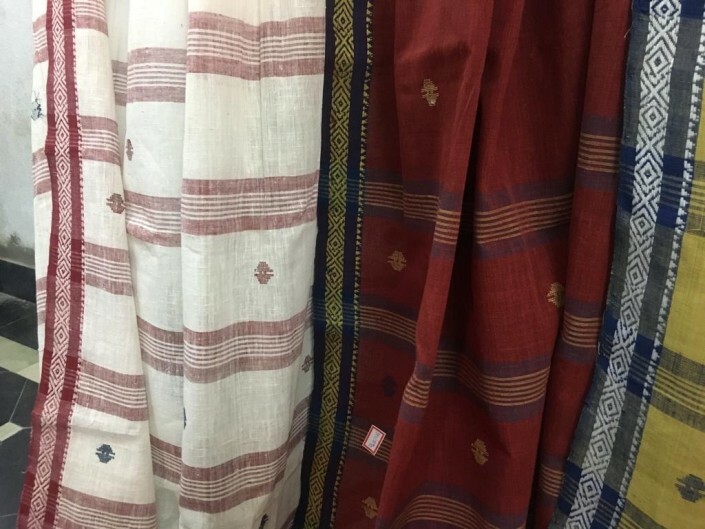 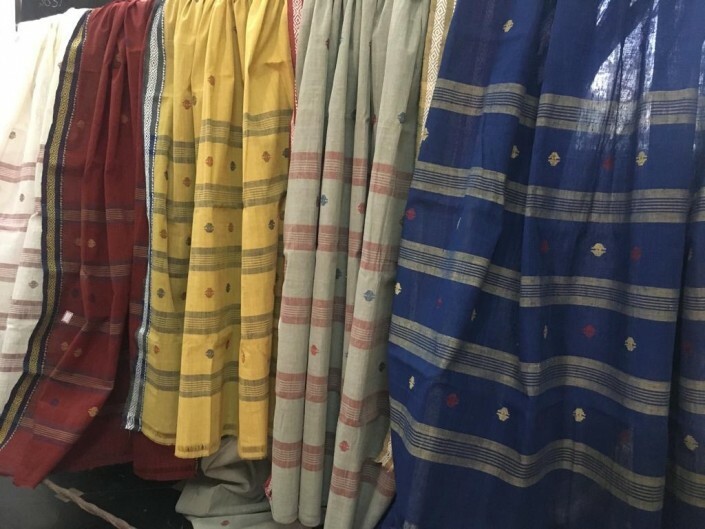 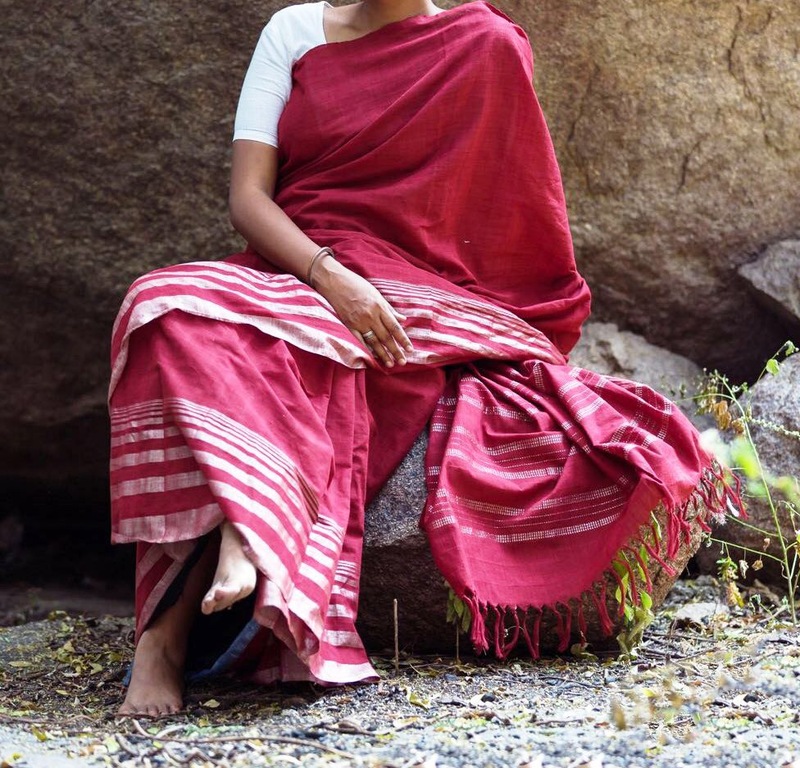 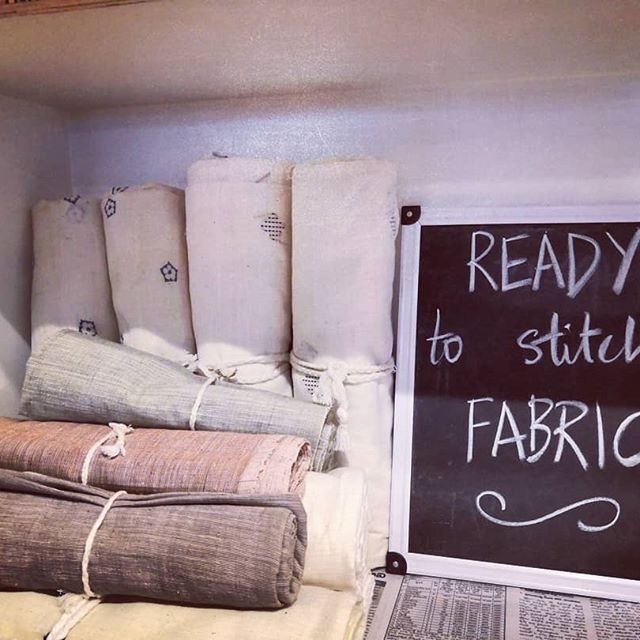 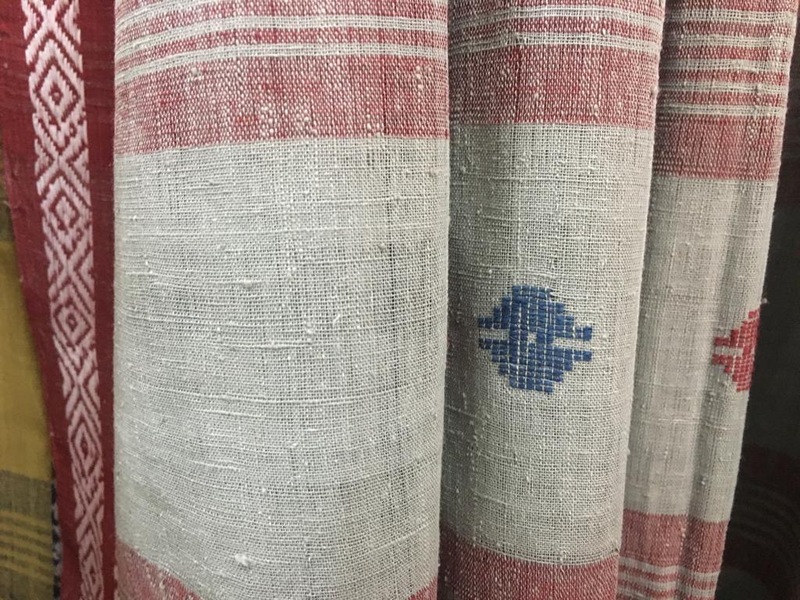 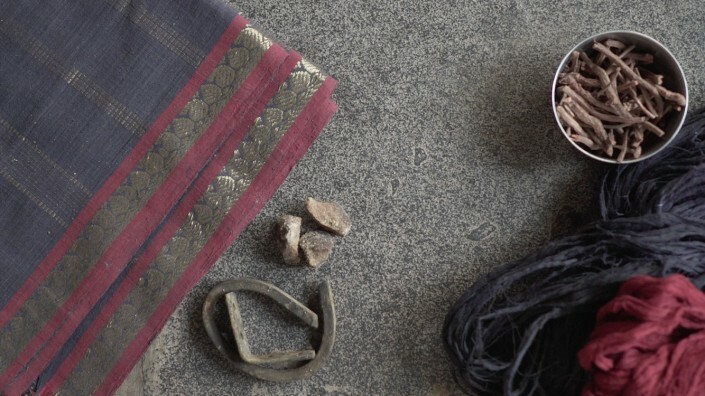 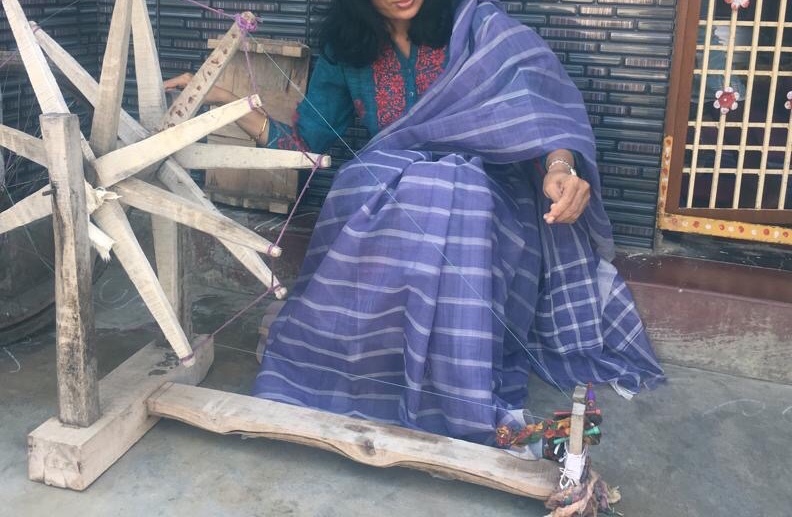 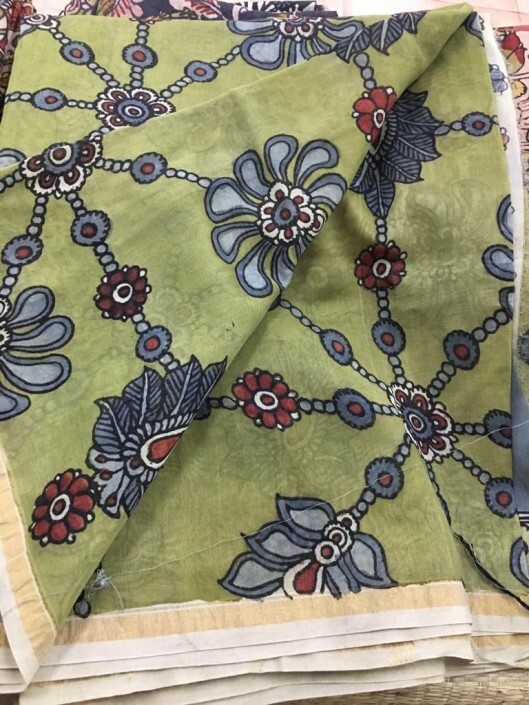 New beginnings also include wearing of new clothes, saris, etc, which are part of Andhra – Telangana’s treasurehouse of brilliant weaves seen in saris such as Mangalgiris, Uppadas, pochampalli, Ikat, Kalamkari, Khadi and other fine handlooms. 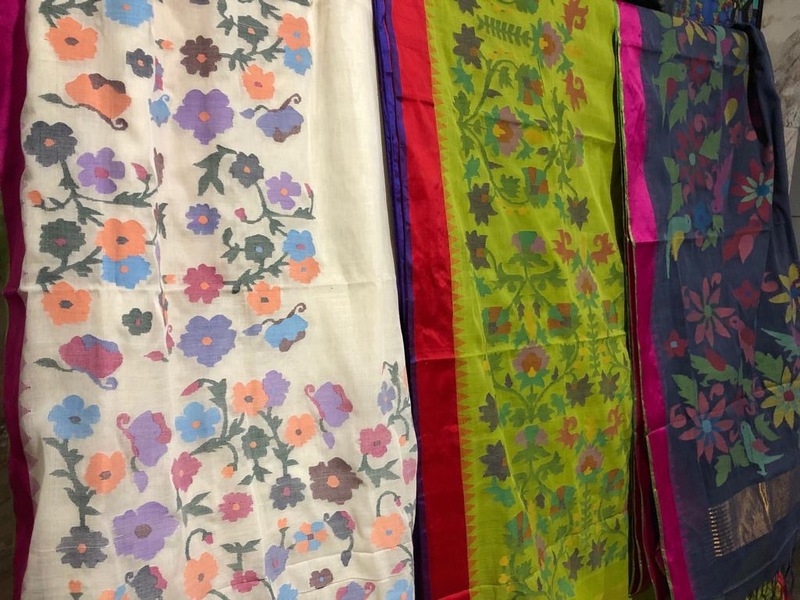 ‘Ugadi Utsav‘ presents a dazzling spread of saris which fit the occasion, the mood and the moment from bridal, festive, party and eveningwear to everyday officewear and power dressing. 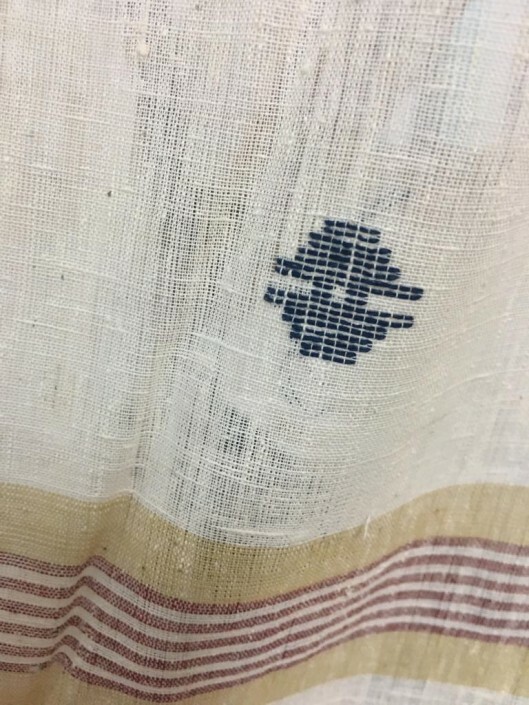 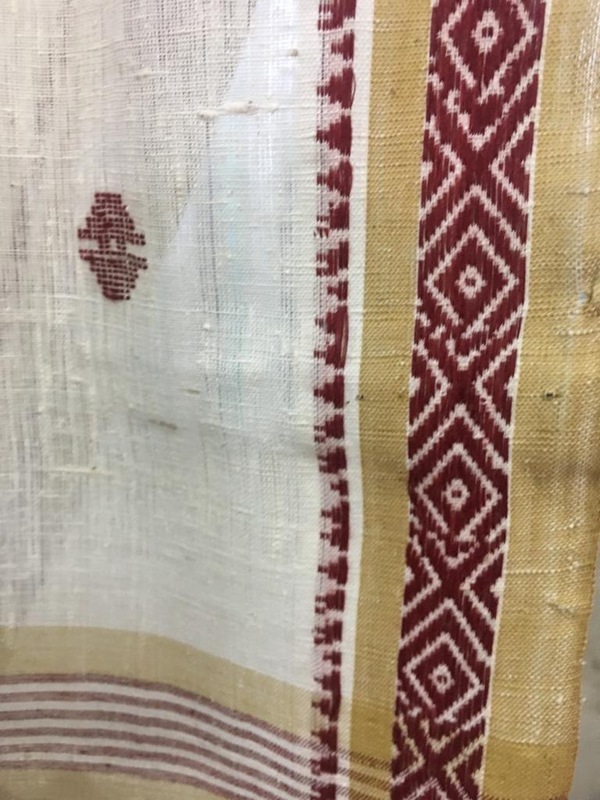 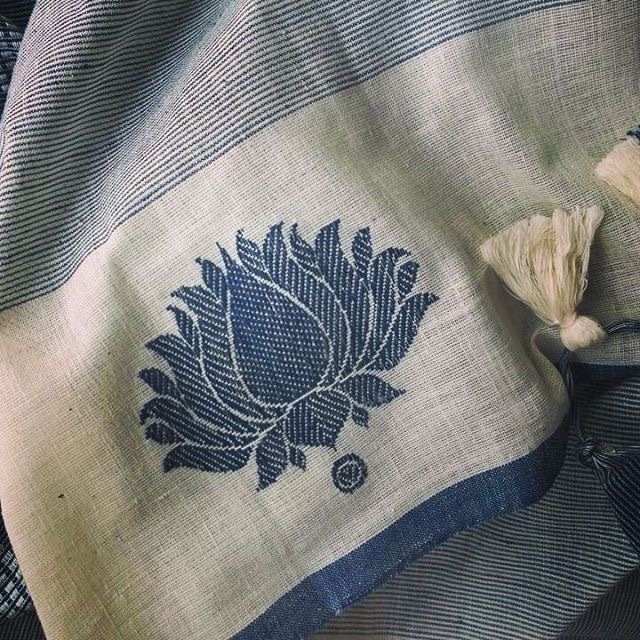 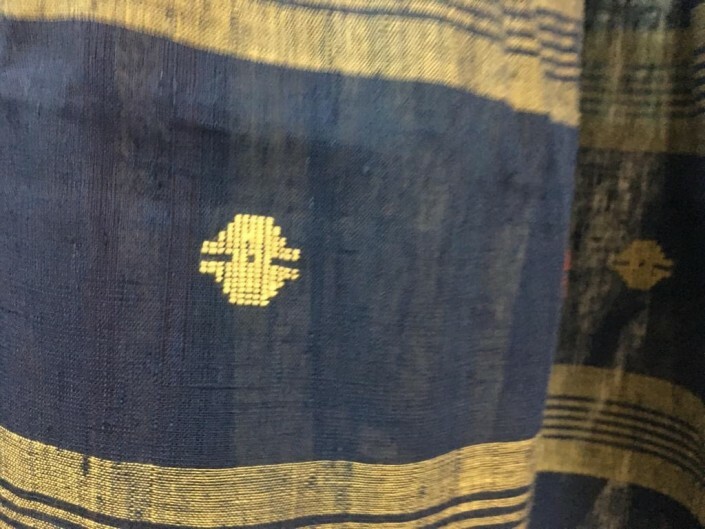 Needless to say, pristine, ancient weaves and techniques tell each ‘Ugadi Utsav’ sari story, yet woven within the framework of today’s sensibilities and style. 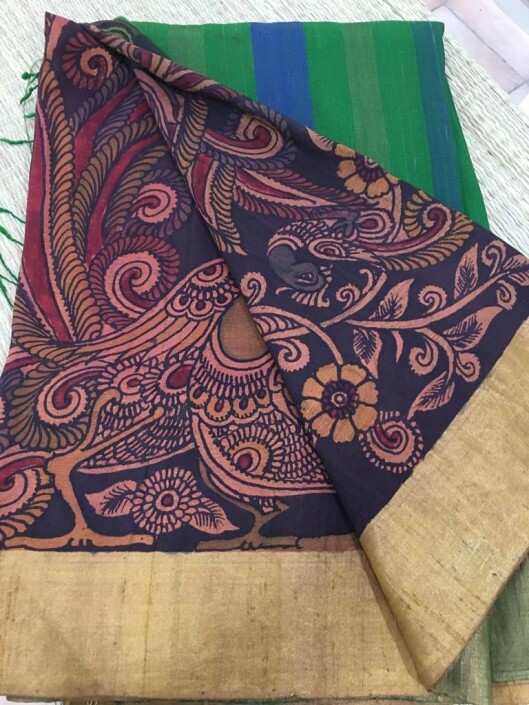 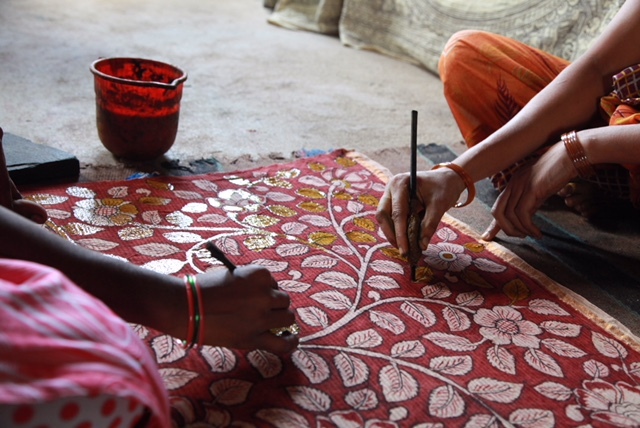 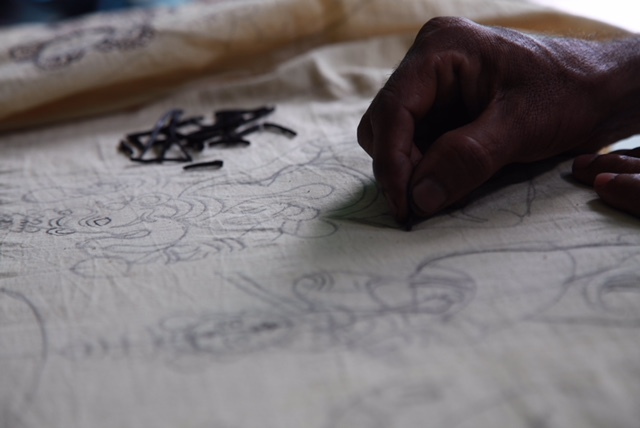 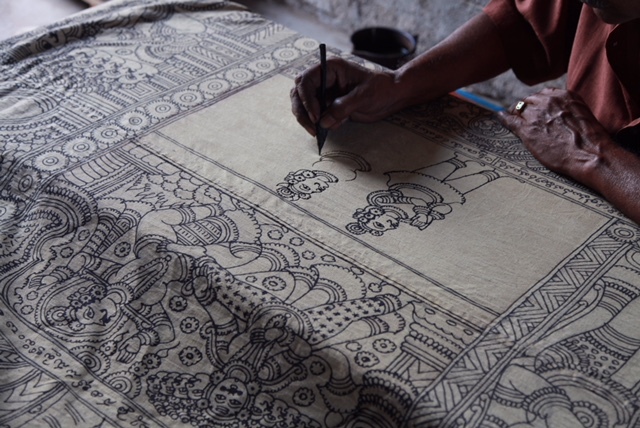 Many, like Uppada, putapakka or kalamkari saris are fabled names, while some saris are woven in remote, little known villages. 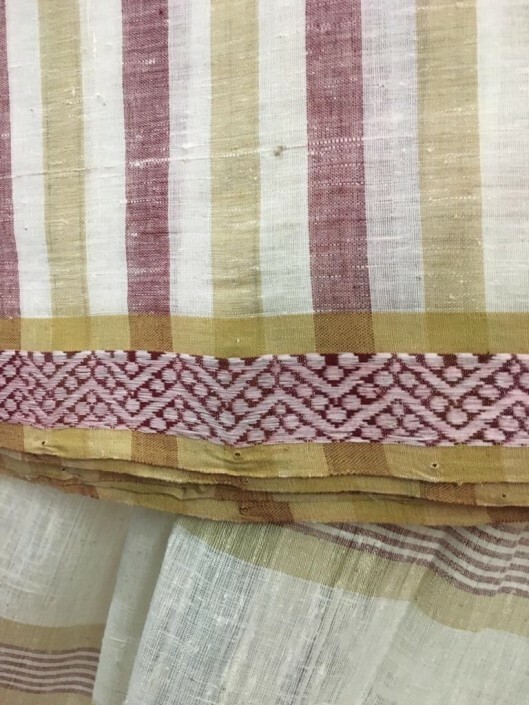 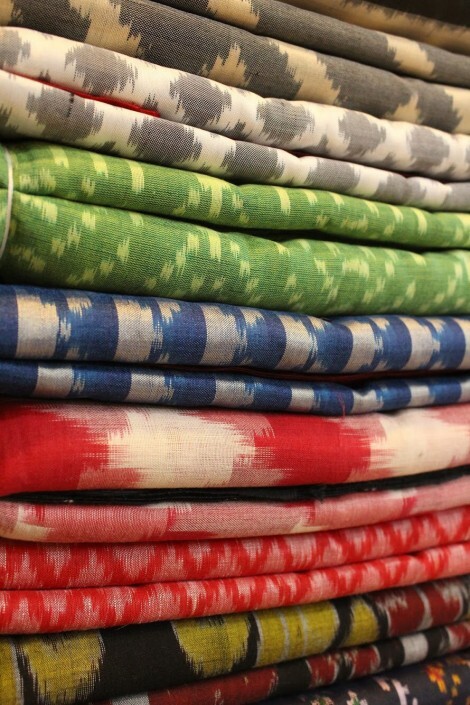 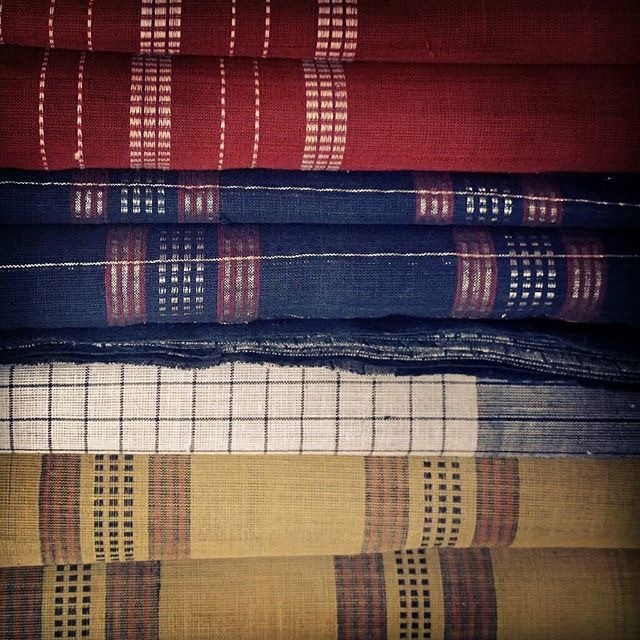 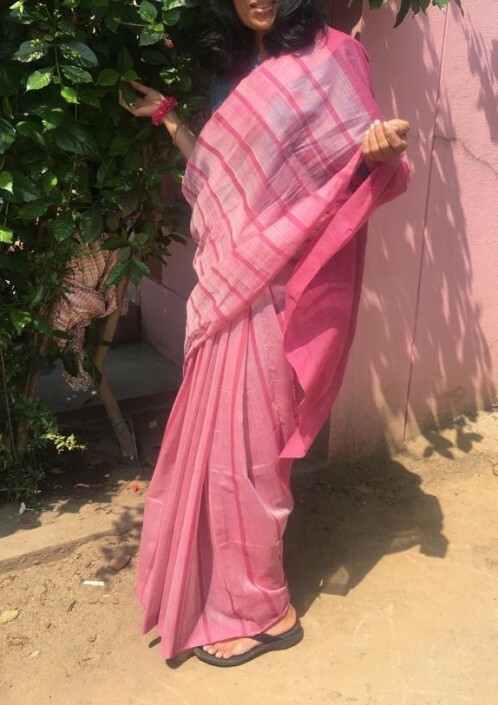 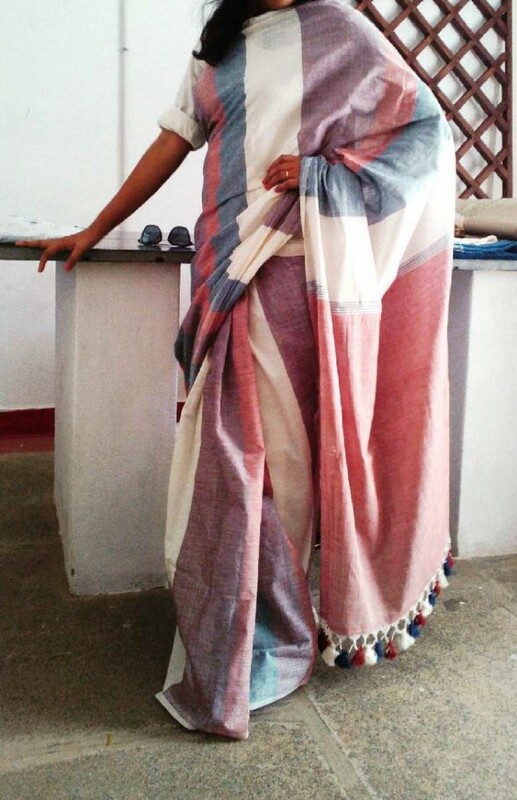 Like the smart striped cotton bobbili sarees woven in the tiny village of narayanapuram near bobbili. 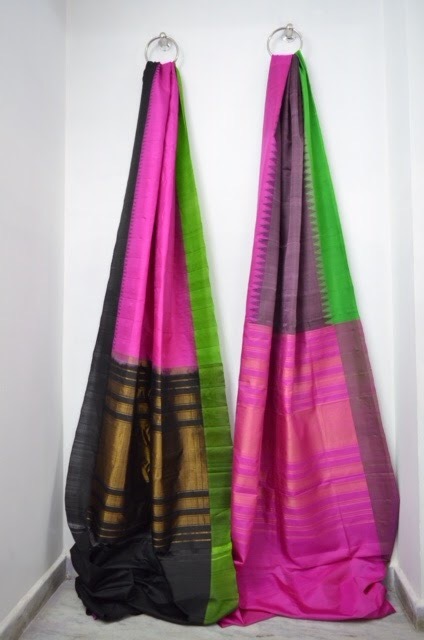 Very affordable, the stripes and broad multi coloured bands running all over the body make chic morning wearing statements. 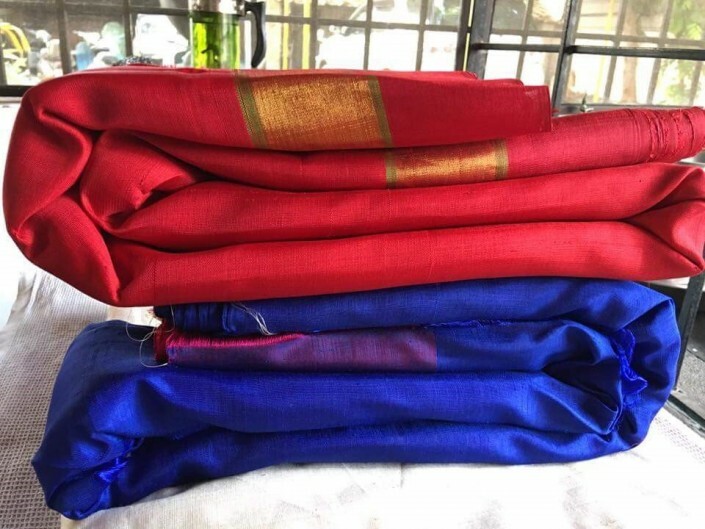 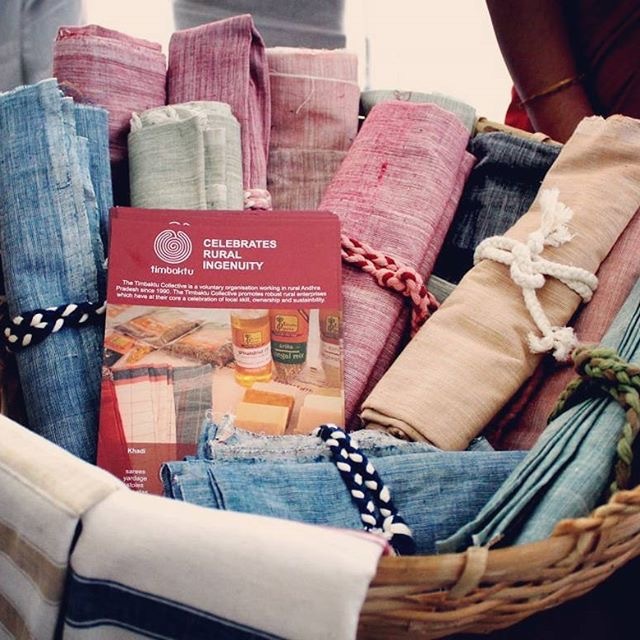 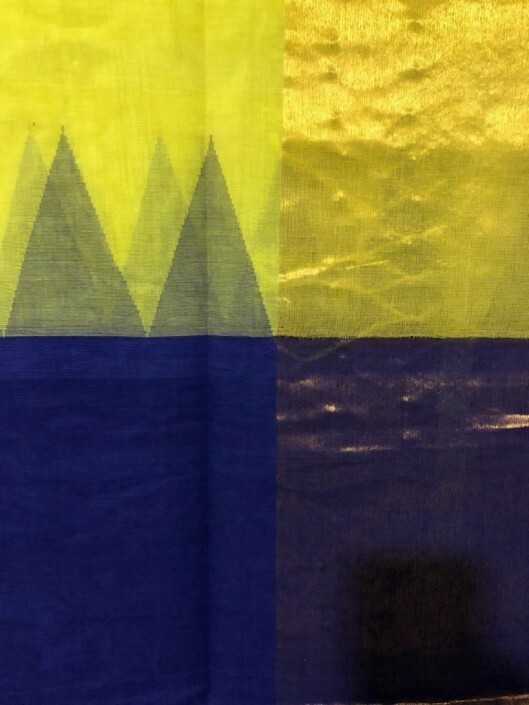 The ‘pulugartha weaves’ handloom sarees make a strike for freedom from colonial exploitation of Andhra’s cotton culture in the process of creating their soft handwoven sarees also known as the freedom fabric in natural dyed colours ranging from deep, jewel tones to pretty summery yellows,greens, blues and beige- plain or butti spattered with dramatic ‘pallus’ and borders. 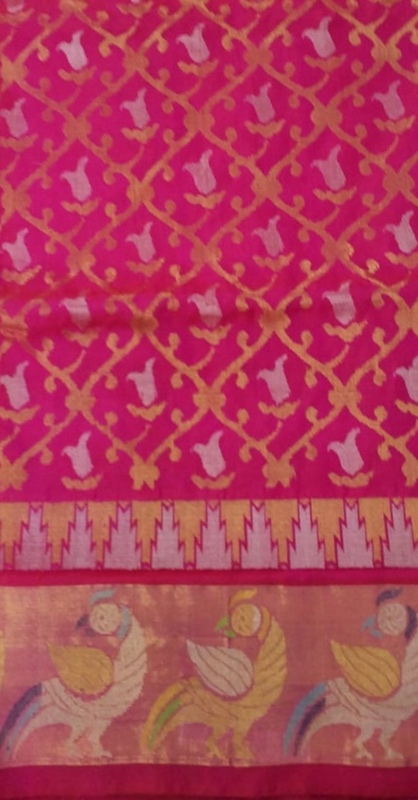 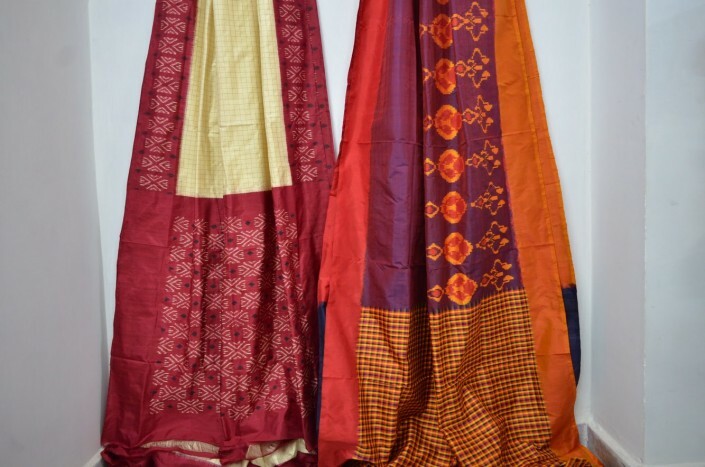 The ‘Uppada’ or pride of Andhra collection presents woven wonders in silk and cotton flaunting fields of exotic multi coloured flowers woven by the jamdani technique on ‘pallus’ and borders. These are artwear sarees bordered with delicate traces of jamdani flower and vine motifs and in colours running the gamut from pretty pastels to Royal purple and blue. 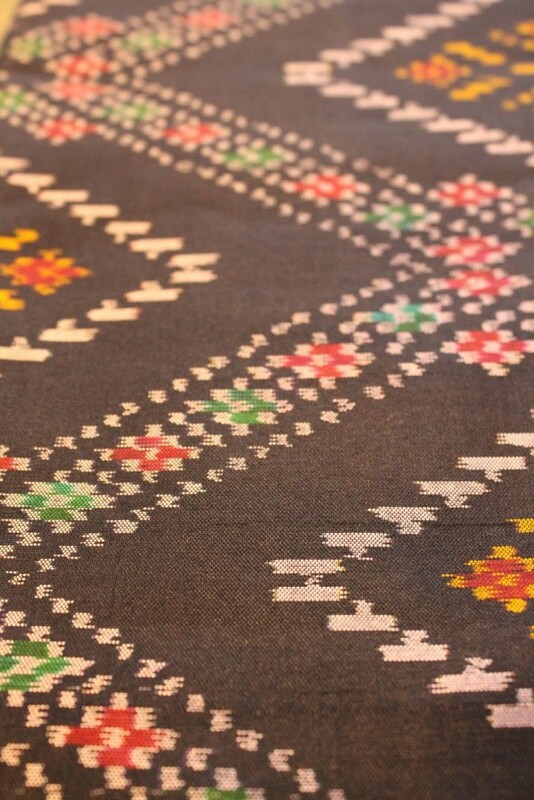 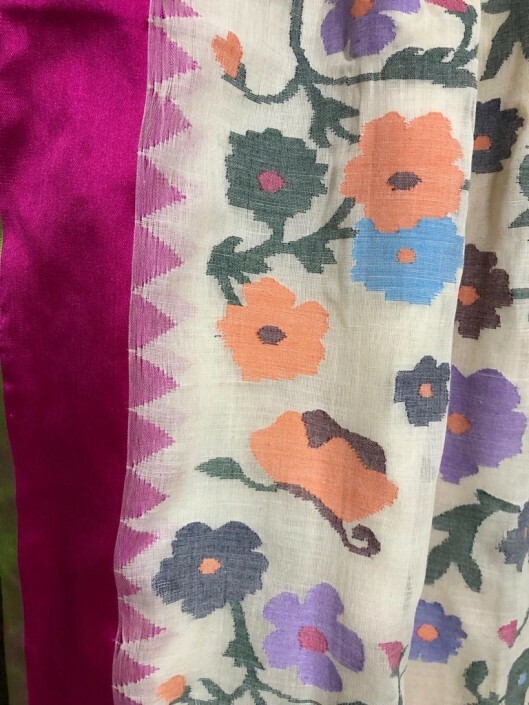 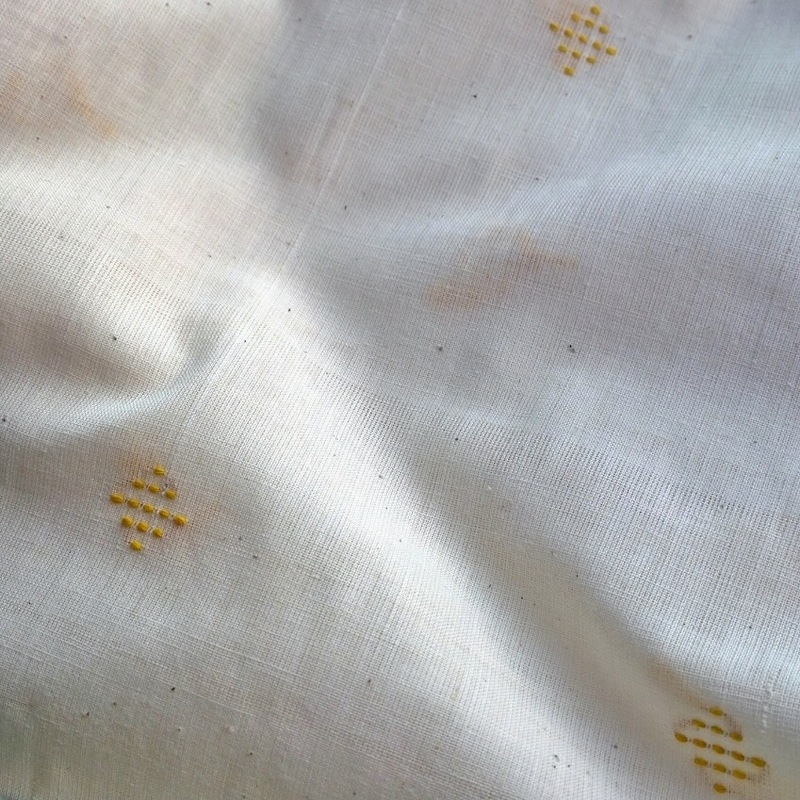 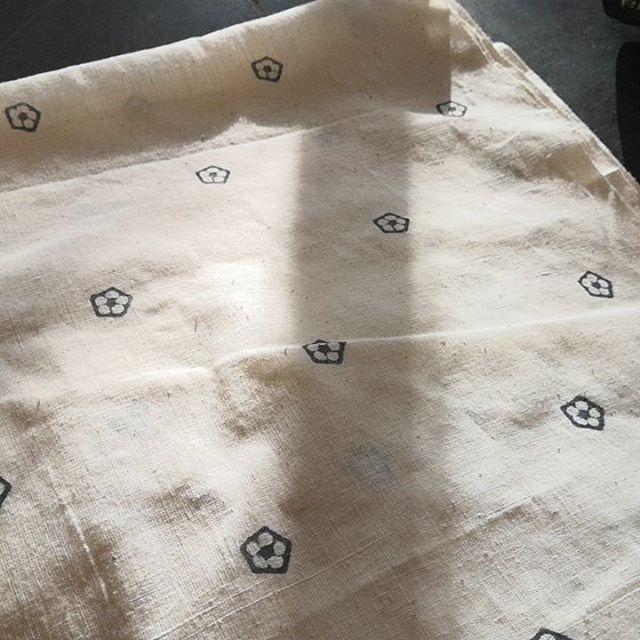 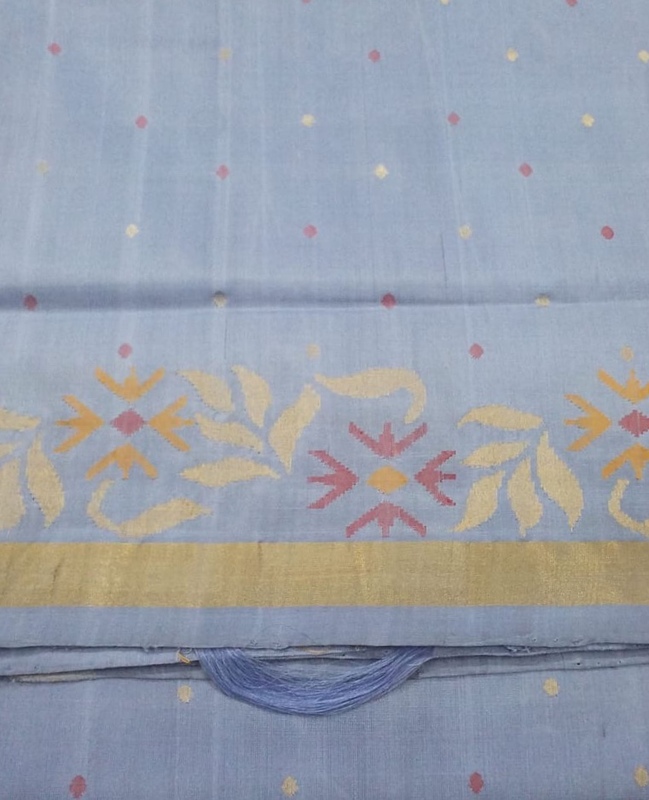 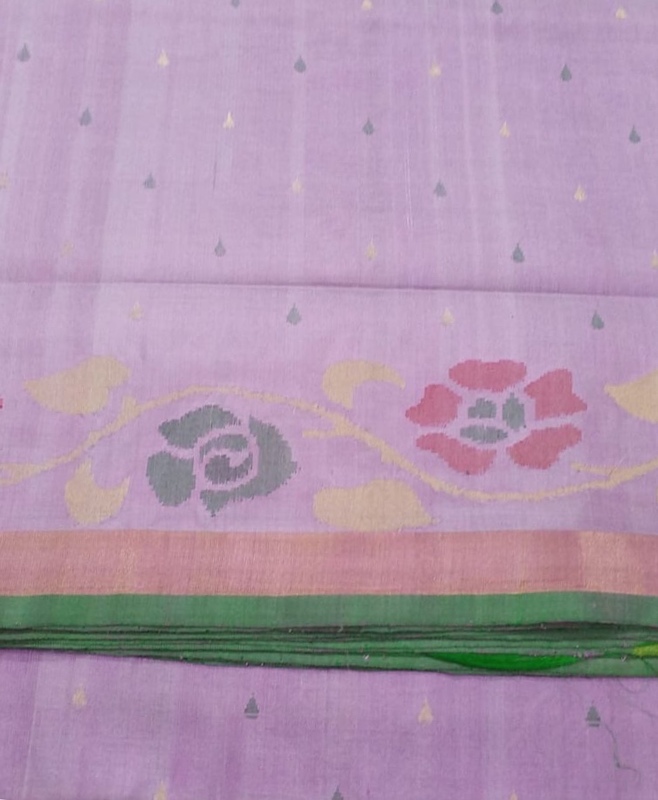 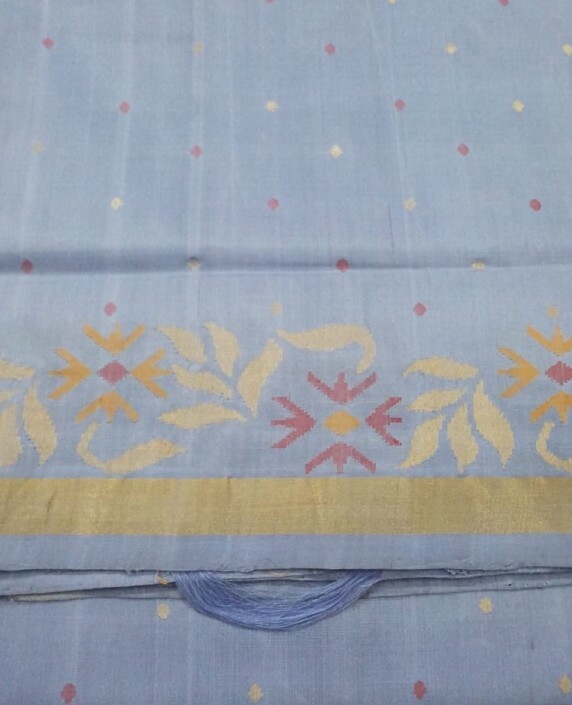 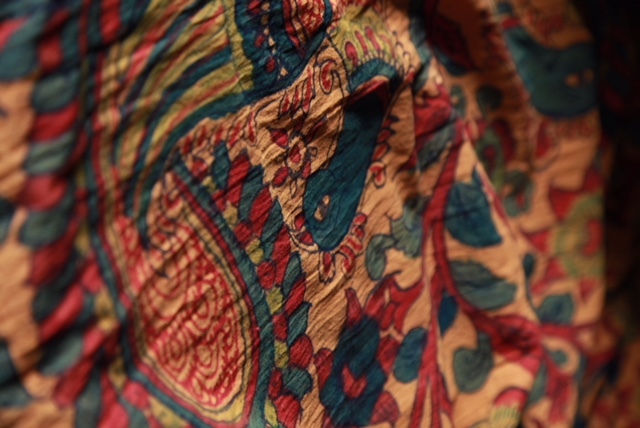 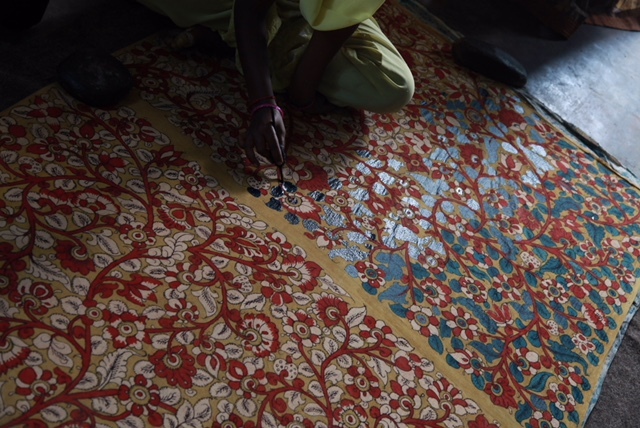 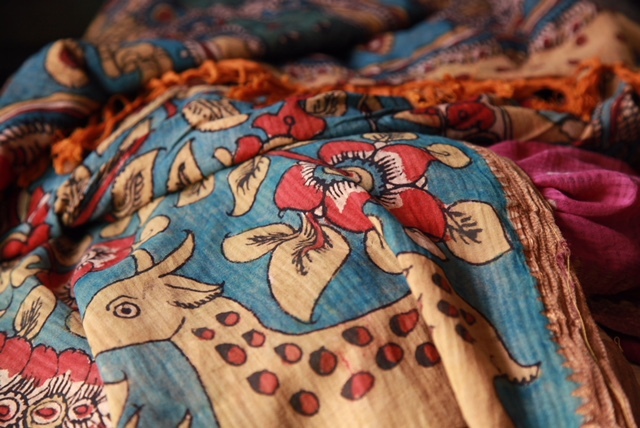 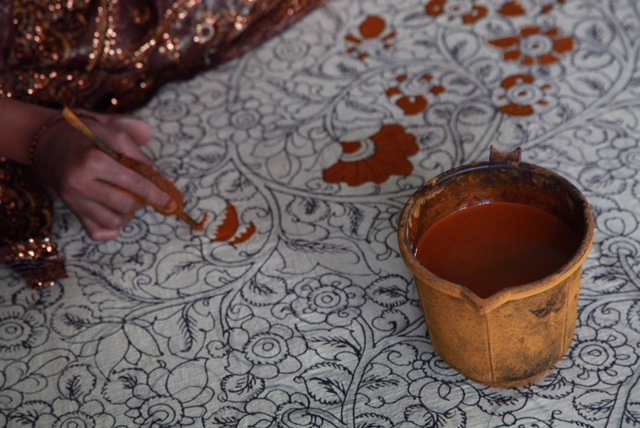 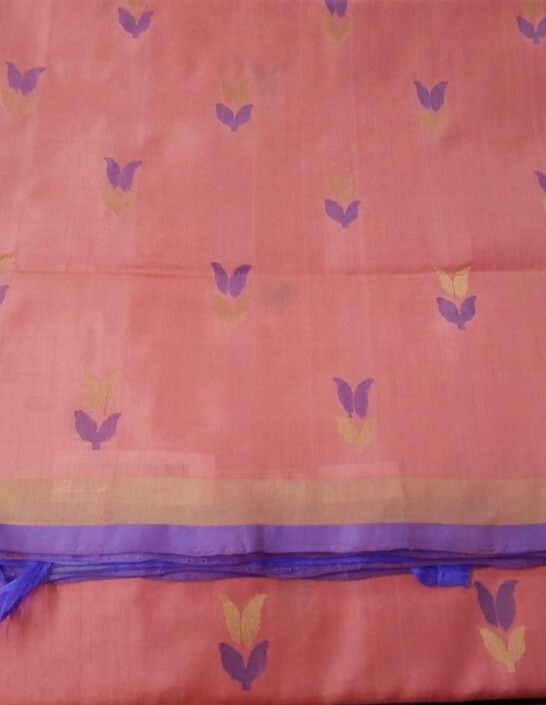 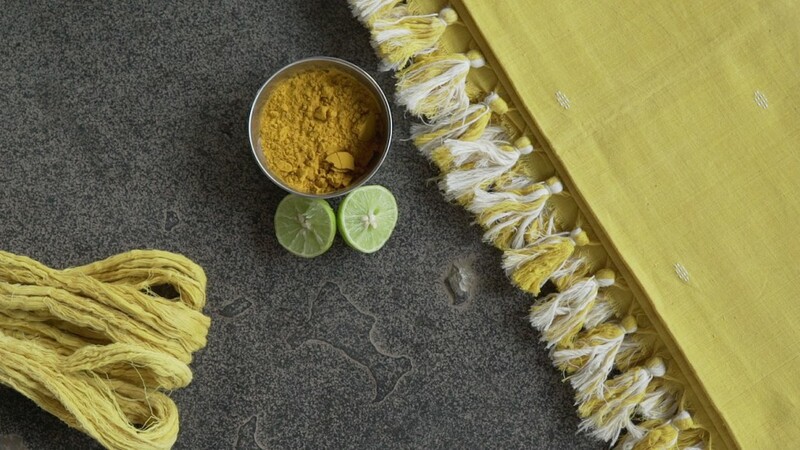 ‘Khadi from Kanakaraju’ also plays out its delicate beauty in soft pastels and lyrically woven fields of flowers. 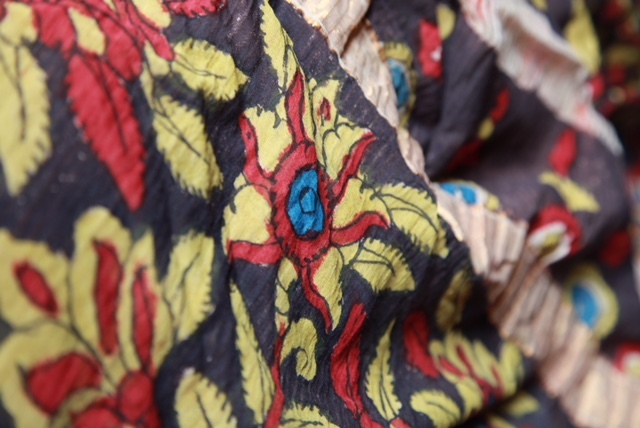 Their ouvre also includes deep dual tone bodies with brilliant colour contrasting borders. 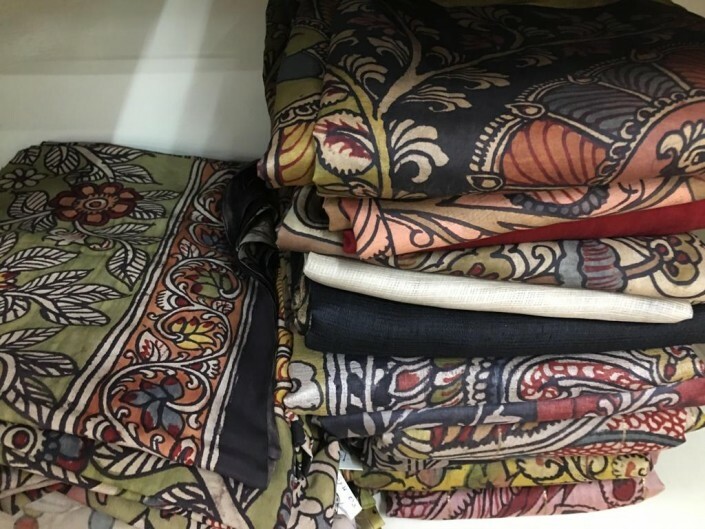 ‘Kalam crafts’ mesmerizing kalamkari sarees fuse all over curvilinear and floral kalamkari motifs with chikankari and ajrak. 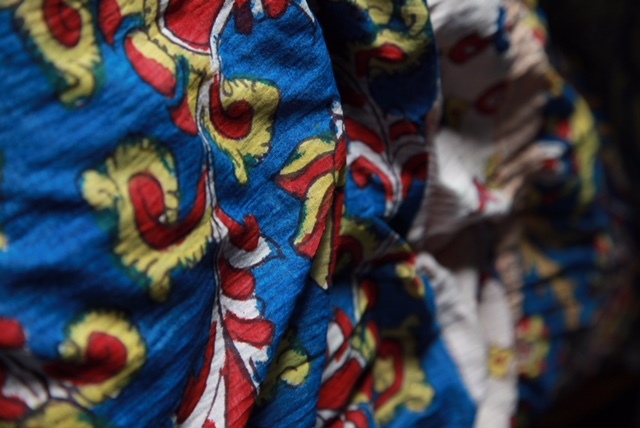 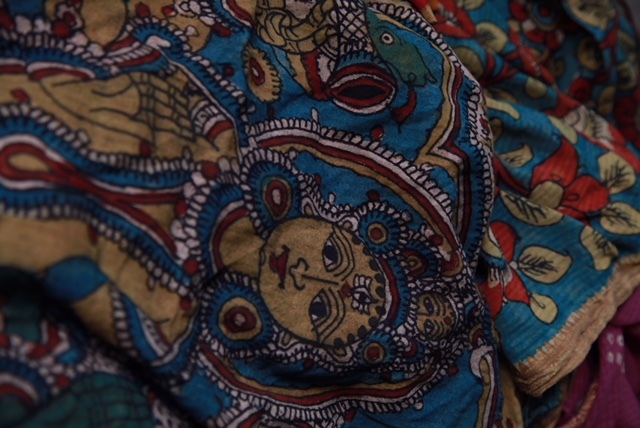 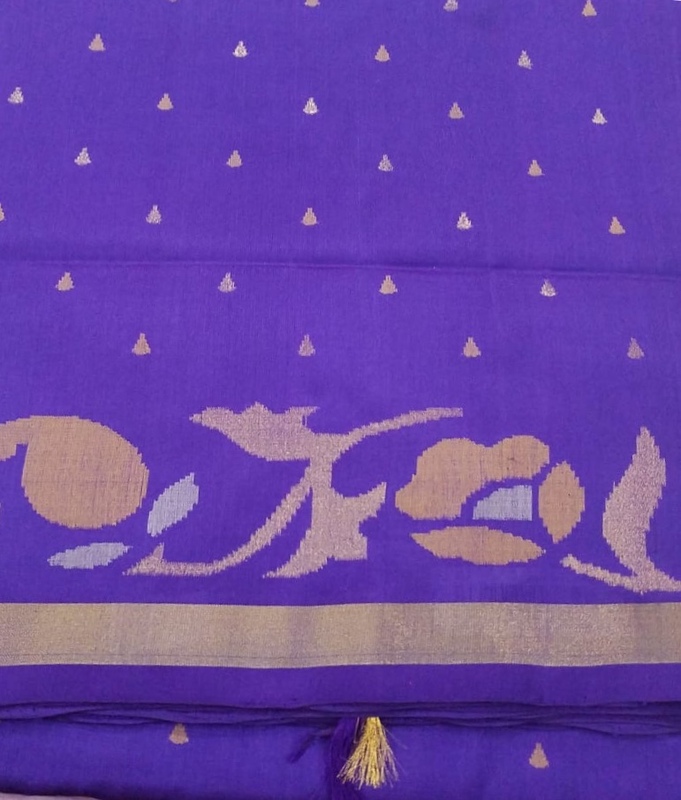 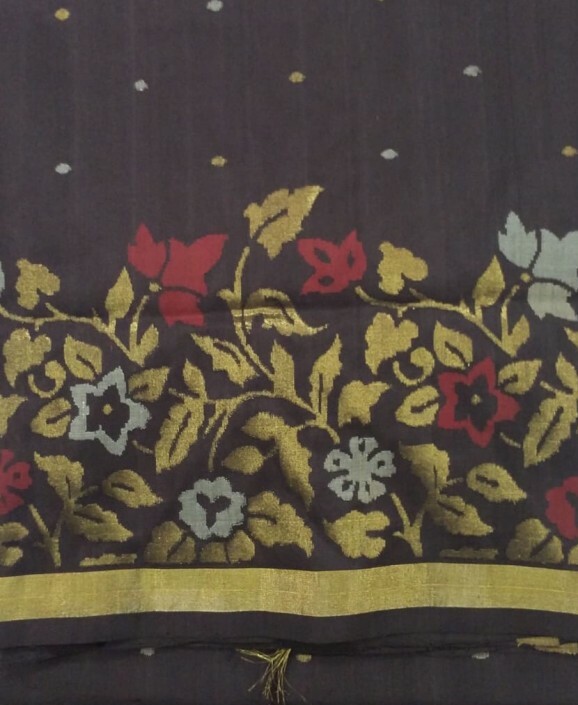 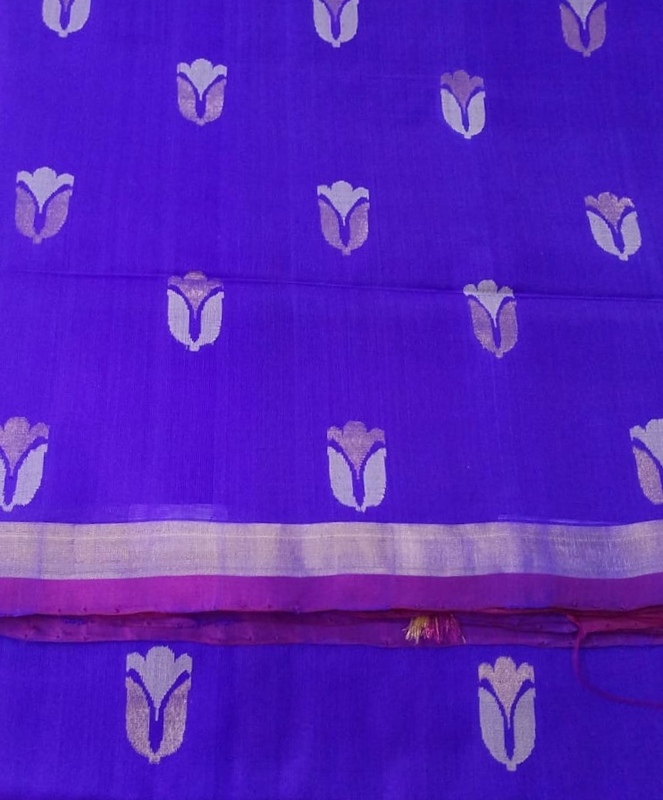 Also indigo sarees with kalamkari art on pallu and blouse. 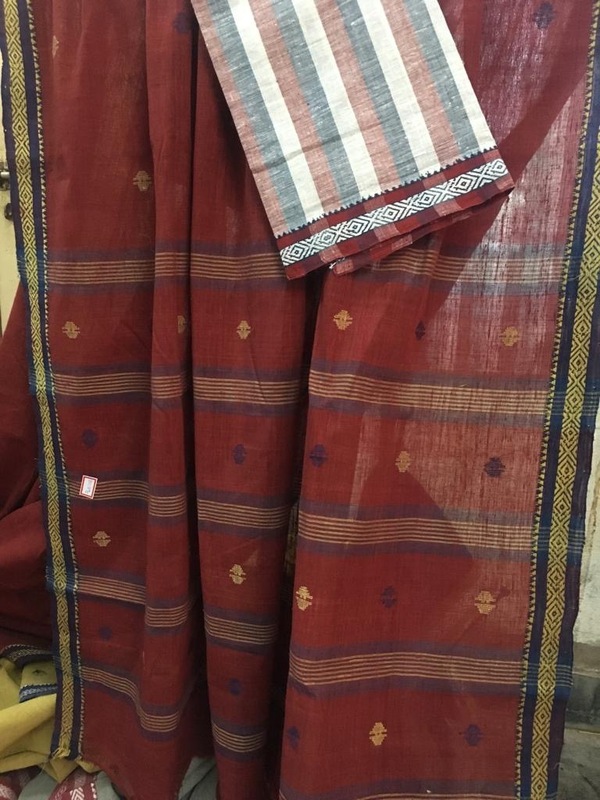 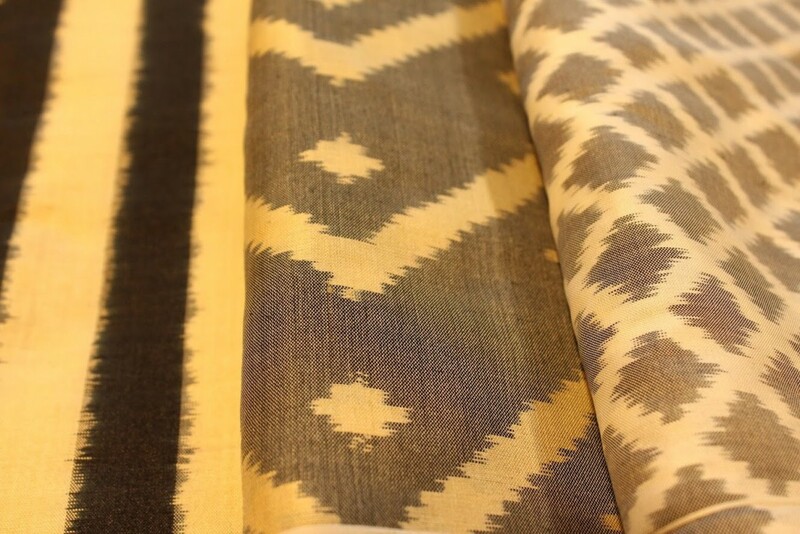 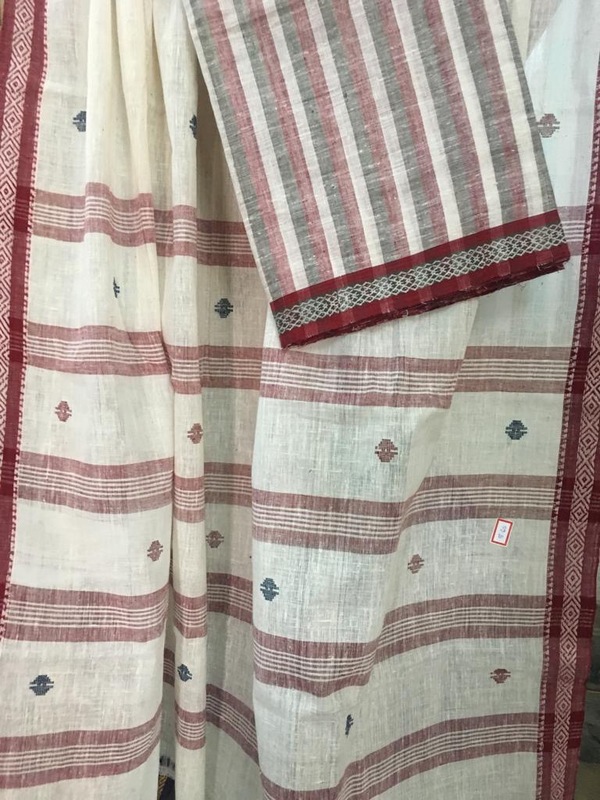 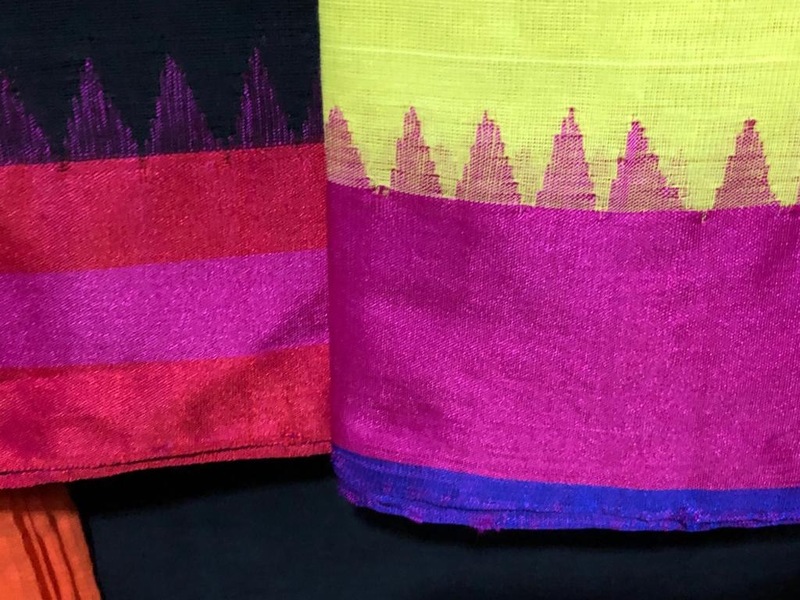 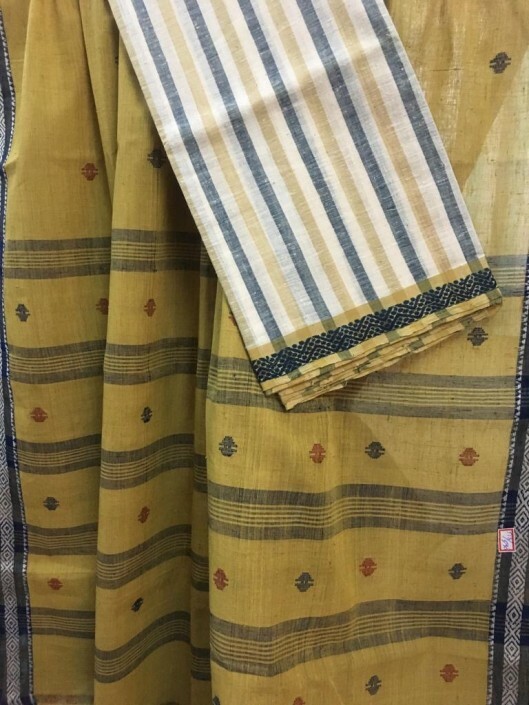 ‘Timbaktu’s’ contribution to ‘ugadi utsav’s’ saree fest, are natural dyed pure cotton sarees and stoles with the weft patterning and all over jacquard motifs. 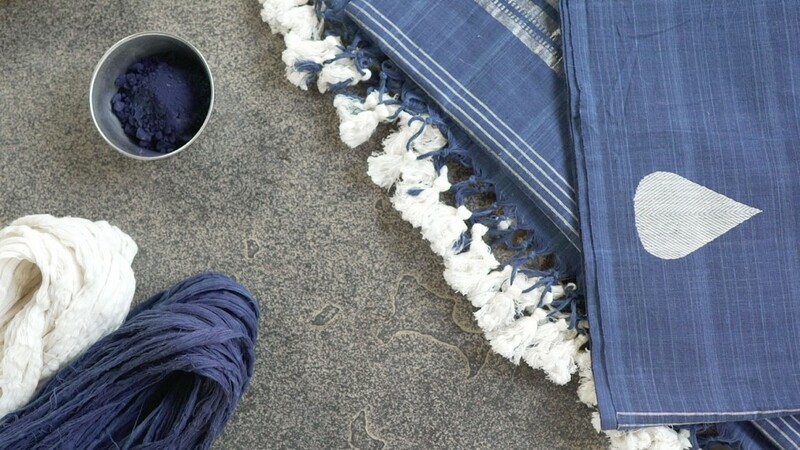 Here is a touch of cool young elegance to the searing summer days ahead. 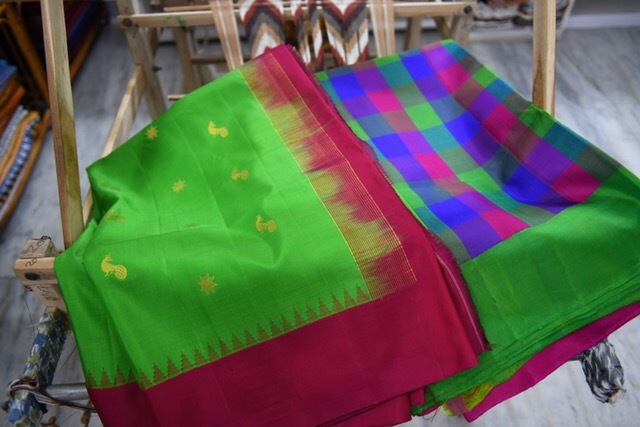 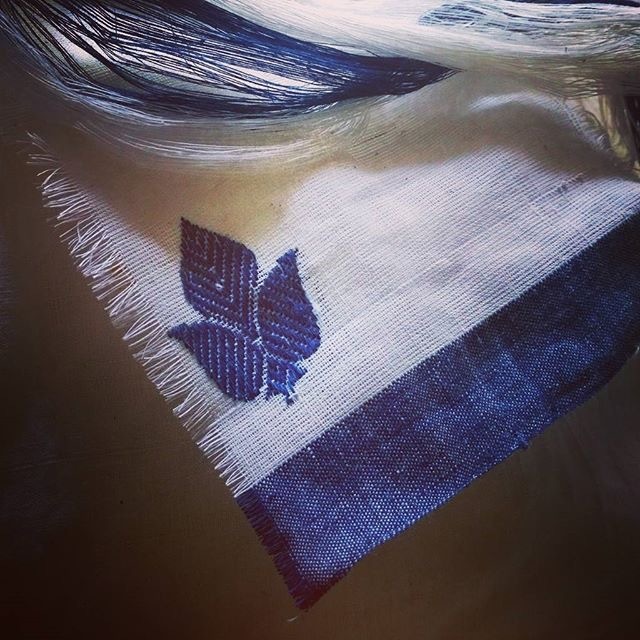 And last but not least other striking cottons brought by ‘Abhihaara’ a social enterprise which works with gadwal, narayanpet saree weavers. 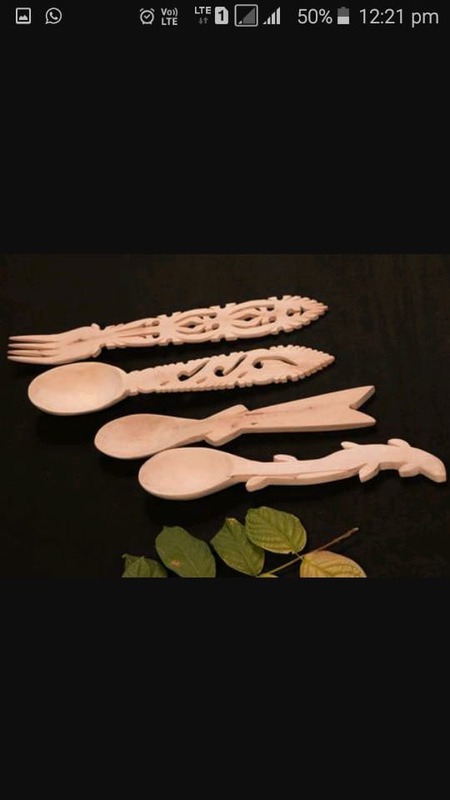 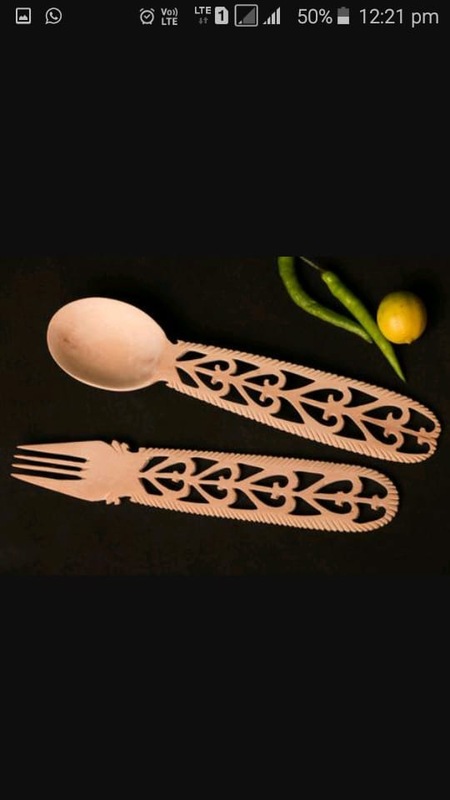 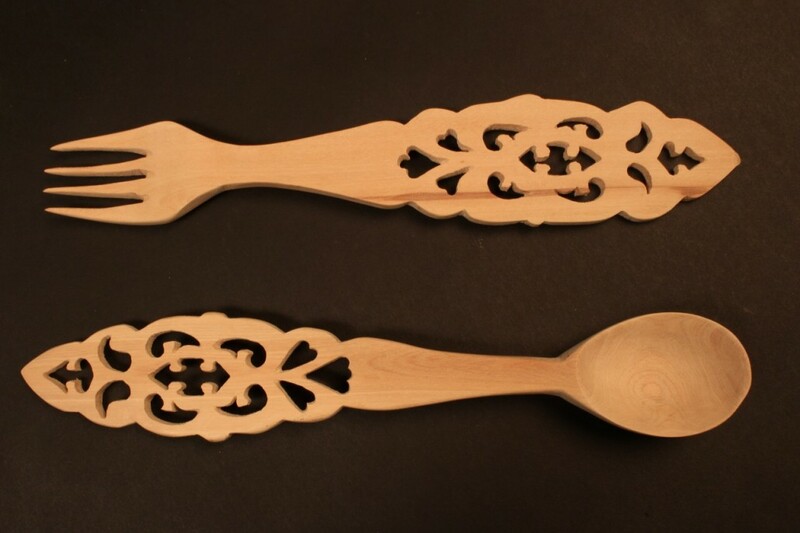 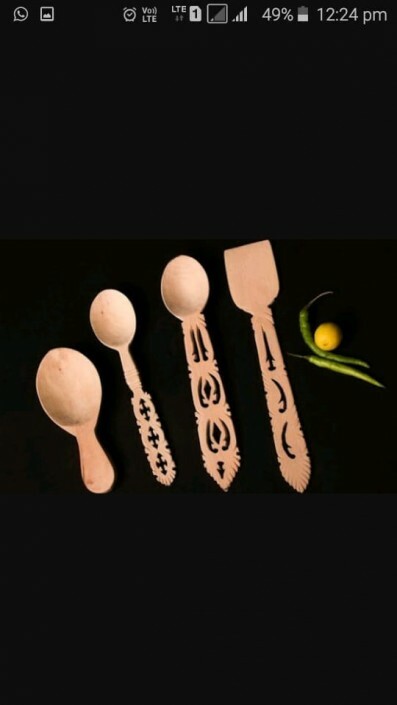 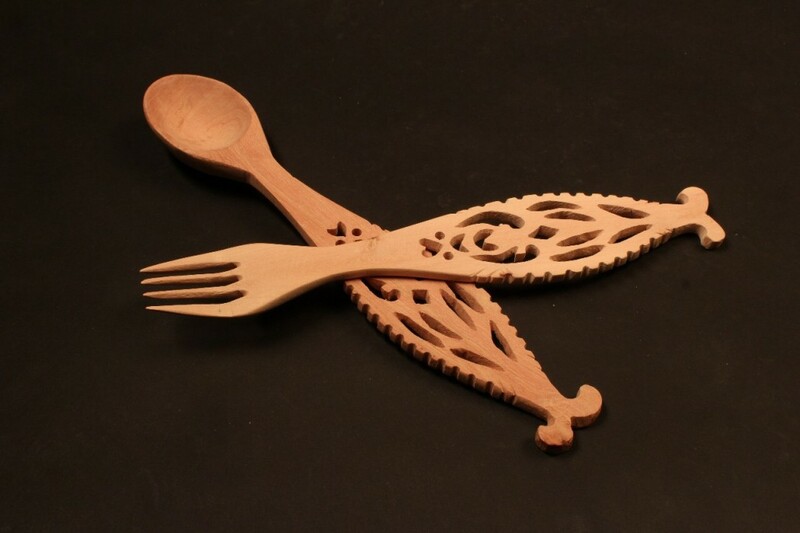 To complete the ‘Ugadi Utsav’ experience, on offer is an attractive range of fretwork Udayagiri cultery, which comes in both traditional and avante-garde shapes. 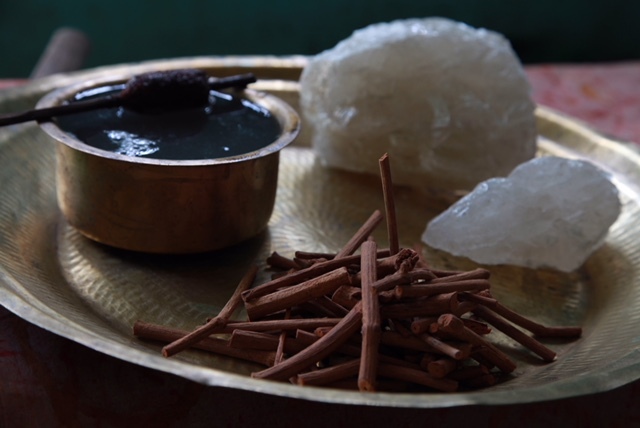 Also available are mouth watering Andhra Telangana and Karnataka podis, pickles, sweets and savouries from Jyo’s farm.